Drive on the left hand side of the road. In outback areas on unsealed roads it is common to drive on whatever side of the road is in the best condition but take great care in bends and crossings with other roads as other road users may not expect you there. In far north Queensland there have been quite a few crashes with Europeans forgetting that Australia drives on the left, wrist bands were issued by authorities as gentle reminders for drivers. Bottle shops. When planning to head out bush and do some camping in remote areas plan ahead with your alcohol supplies, you might find that the only bottleshop in town ( and the next town 500 kms down the road) is closed because it is social security pay day, and authorities try to get the local population to spend some money on food for the kids before spending it at the pub. Argueing with the bottle shop staff that you are a tourist will not get you anywhere, rules are rules. Do not drive at night in outback areas. A lot of cattle stations are not fenced and cows often wander around or sit on the roads at night and the darker ones are very hard to see. Also kangaroos are a hazard as they will freeze in position when your headlights shine in their eyes or even when they are next to the road they will try to flee from the noise of your car and will jump where they can most easily see where they are going, which is in the lights in front of your car! And if you don't have some bars up the front then you can start singing "see you later, radiator!" If your car is equipped with bars on the front, do not expect too much, the cheap and light ones will just fold away, some heavier ones may just protect your radiator so you can make it to the next town but will still crumple the front of your car and only the heavy duty ones on a large four wheel drive may, at not too high speed, get you through it without a repair bill. 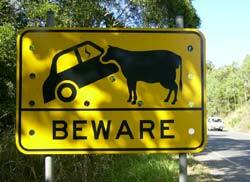 Though they are often called "bull bars" it would definitely not be a good idea to actually hit a real bull with them. When passing through outback towns at night you may encounter people under the influence of alcohol on the road, in February 2004 a Katherine police car on patrol ran over a man and killed him. Stay with the vehicle. Over the years numerous people have died trying to walk back to civilization after their car got stuck or had broken down. Search and rescue planes can easily spot a car from the air but a person is much harder to see. About 100 km down the track from the Queensland outback town of Birdsville is a memorial to the Page family who tried to walk out, after their car had broken down in 1963. All five members of the family died. This is only one example, there have been many more since then. 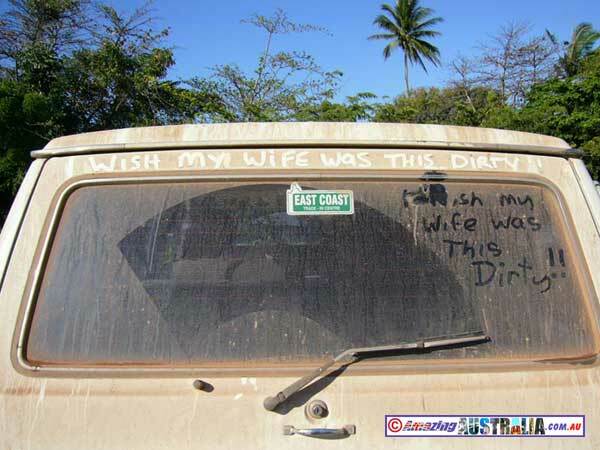 Drive wisely. Just because the Northern Territory does not have speedlimits or there is no police to be seen is no reason to do 180 km/h, animals do cross the road from time to time. Also beware of the wedge tailed eagles, these are eagles with wing spans of a couple of up to two metres and they feed on road kills on outback roads. If you approach too fast they may not have time to fly off and end up coming through your windscreen. Often accidents are due to tyre blowouts too, make sure your tyres are up to the long journey, tyres in remote areas are remarkably more expensive than in the city. 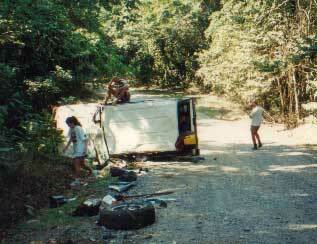 Take rest stops, many accidents are due to tired drivers. Although the coffee at outback roadhouses is often of a shocking quality you may have to drink some to help you stay alert. Look at your speedo when you pull into a petrol station, after doing 130km/h for a few hours you may feel like you're doing walkingpace coming into the petrol station when you're still doing 70km/h. Title Max wants drivers to be safe on any road they travel. Excessive speed is the main cause of most serious accidents, so drivers should heed the advice whether they have a Title Max title loan on their vehicle or not. If you're on narrow roads or dirtroads pull over if you see a roadtrain, their hundred or so wheels throw up a lot of rocks so you want to stay away as far as you can from that. It is a good idea to keep your headlights on on dusty roads, it makes your vehicle much easier to spot in the clouds of dust that get thrown up. Grey nomads are a seasonal hazard, usually migrating in a northerly direction in winter and back south again in summer. The term refers to retired people that travel around the country, some endlessly as they sold the house to pay for their caravan or mobile home with absolutely every modern convenience ever invented, and often travel at speeds of max. 70km/h unaware of traffic banking up behind them as the caravan is too wide for the mirrors to be of any use. This often leads to people overtaking in dangerous situations. Four wheel drives. If you are renting a four wheel drive to go and do some exploration remember that, apart from some modern continuous all wheel drive vehicles, often the four wheels d not actually get driven until you get out and engage the hubs on the front wheels, the gear stick inside the vehicle is only half the job. If you drive on soft sand lower the tyre pressure; it is amazing how much difference it makes when you think there is no way you can get out if this place and you let some air out of the tyres. A few years ago a tourist got his 4WD stuck in Lake Eyre in South Australia, he decided to walk to get help ( first mistake; stay with the car) and died when he ran out of water. A companion that stayed with the car survived and when rescuers arrived they let some air out of the tyres and drove the vehicle out! When driving in a four wheel drive remember the centre of gravity is higher in this type of vehicle, single vehicle roll overs where there are no other cars around and the driver just lost control are common. If your vehicle has a roof rack do not put too much weight on it as it will make the vehicle top heavy and more likely to roll over. Dry areas. Some Aboriginal reserves and large areas up Cape York have been declared dry areas, meaning you can not take any alcohol in there or have in your possession. Tourists have been fined thousands of dollars for having alcohol with them on their holidays, if you're heading this way ring 1300 789 000 for up to date info on restricted areas. On the train. When you take the train in Melbourne hang on to your baby's pram at all times. Within a space of a few months no less than two babies in prams managed to drive off Melbourne railway platforms, but both survived without major injuries despite falling on the tracks and being dragged along by the trains. Actually, come to think of it, there is no need to worry about your baby falling in front of Melbourne trains because statistically speaking they currently have a 100% chance of surviving anyway! 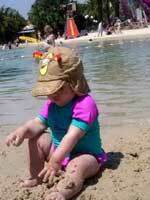 This is how Aussie kids enjoy the beach. In the sun. Australia, and particularly the state of Queensland, has the highest rate of skincancers in the world! Melanoma, the nastiest type of skin cancer, kills hundreds of Aussies every year. Many tourists think they will be OK as they are only here for a short time and their holiday will not be succesful if they do not return home with a sensational suntan to make all their friends and colleagues jealous but they really should protect themselves from the sun. Remember the sunshine in Australia is not the same as in Europe, due to a hole in the ozone layer that hangs over Australia and New Zealand ( even on a chilly day in Auckland or Melbourne you can get a serious sun burn). So use your hat, sunscreen and sunglasses. The World Meteorological Organisation measures the hole in the ozone layer every year that hangs over Antarctica and reaches out over Australia, in 2005 it measured 27 million square km. When lost in a hot place take it easy, find some shade, preserve your energy and water. 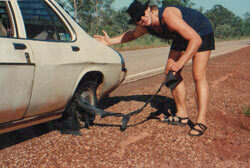 An example is the German tourist that became separated from the tour group in the Olgas near Ayers Rock. He panicked straight away , started running around in the heat that was in the 40s that day and when found, only an hour later, had already died from heat exhaustion. Had he sat down in the shade he probably would have been OK for several days to wait for searchers. Coconuts can be a great drink when you're thirsty, and easy to get in to with the cocotap, buy one of those gadgets as they will get you a refreshing drink and do lots of other stuff. It is a good habit to keep an eye on the sun at the start of your walk and throughout it. Remember the sun is in the EAST in the morning, NORTH at midday, then moves further anti-clock wise until it sets in the WEST. This is the opposite direction of the Northern hemsiphere where the sun goes clockwise and sits in the SOUTH at midday. If you lose the walking track navigating by the sun can help you find your way back again. When you're camping it is also not a bad idea to give your boots a shake in the morning before putting them on your feet, something might have made itself at home in there through the night. Tell someone your plans. It is a good idea when you set off on a bushwalk or boat trip to tell someone your plans and your estimated time of return so they can raise the alarm if you do not return. Of course it is also very important to tell same people again that you have returned, it has happened many times that time and resources were wasted looking for people that had safely returned but not bothered to inform people of this. 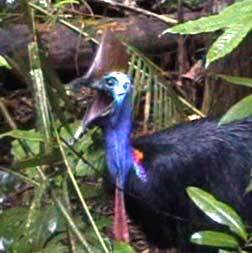 Cassowaries like to chase people so if you come face to face with one do not turn your back and run, this will encourage him to chase you and you can run for miles, the bird can do 50km/h so you are not going to outrun him anyway. Back off slowly, hold something in front of you, go behind a tree or raise your arms up to look taller. Coconuts can keep you alive for a long time, when a boat sank in the Torres Strait some kids survived by swimming a great distance to an island with one coconut tree where they drank coconuts until they were rescued a week later. It can be hard work getting in to a coconut but with the Cocotap life becomes a lot easier, the Cocotap website will also teach you how to climb those coconut trees.. Jumping and diving off cliffs is a common way to end up with serious injuries or even die, each year around Australia lots of people end up hurting themselves this way, including myself who fractured a vertebrea in the Kimberleys and had to wait two days to get to Broome hospital. 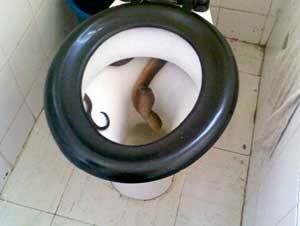 The advice is; DON'T !! 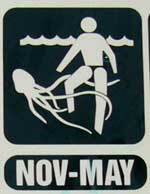 Animals in northern parts of Australia can be nasty and there are box jelly fish from about end October till May. They can kill you within minutes so it is wise to look for the stinger nets that local councils provide at their beaches or if none are present find a swimming pool or creek. If you do get stung the best first aid is to pour stung area with vinegar ( often found supplied at northern beaches) and if victim loses consciousness mouth to mouth resuscitation and CPR as the toxins paralyze the muscles for breathing and heart beat. Of course it is better to not get stung in the first place and to wear a stinger suit, on Stingersuits.com you can read all about this Australian invention and see where they are for sale. If you do choose a river or lake to swim ( in the north) check with locals that there are no saltwater crocodiles as this could also ruin your day. Coral should not be touched or stood on. One reason is that coral is a living organism made of tiny polyps that you kill by crushing them, another one is that if you scratch yourself on coral it can give nasty infections. When swimming in the ocean anywhere around Australia stick to the beaches patrolled by life savers if you are not confident in judging the situation, many parts of the coast have undertows that can drag you out to sea. Lifesavers place red and yellow flags to indicate the area they monitor and will close the area if they consider the area unsafe because of undertows, jellyfish, crocodiles or sharks. There are nearly 300 lifesaving clubs around this country that rescue 12000 people a year and in February 2004 as many as 200 people in one day had to be rescued on the Perth beaches. Riptides or undertows can unexpectedly drag you out to sea, the best thing to do if you find you cna not get back is not to fight it and exhaust yourself but try to get the attention of lifeguards or people on the beach by waving. Even if nobody sees you it is still better to float out a bit on the current and to swim back a bit further up or down the beach where there is no current. Sharks tend to go for blood so one survival technique by scuba divers is to always dive with a buddy and always have a knife with you. Then if you see a large shark approaching you take the knife, stab your buddy so he starts bleeding profusely and rush back to the boat for a beer to calm the nerves while the shark feasts on your buddy. This was actually meant as a joke so please don't tell the judge that we told you to do this, but in 2005 several people survived shark attacks simply by punching the shark in the head, so this is a recommended survival tactic. Sting rays often lie hidden under sand in the shallows on the waters edge, it is best practise to either splash and make plenty of noise or shuffle your feet so you don't actually step on top of them as this will cause them to whip the end of their tail around and stab you with a sharp barb which usually stays behind in the wound and is extremely painful, and you don't want to end up like Steve Irwin!. Crcodiles come in two varieties; the 'salties' will eat you and the 'freshies' are harmless and usually OK to swim with so see what type of crocodile is in the water where you plan to swim first.The most easily noticed difference between the two is the shape of the head and teeth. - Freshwater crocodiles have longer and thinner snouts, with a straight jawline, and all their teeth nearly equal in size, also they do not grow longer than a maximum of three metres. - Saltwater crocodiles have a broad, powerful-looking snout, with an uneven jawline. Their teeth vary in size with some almost twice the size of others. Theiir overall body size can be up to seven metres. Salt water crocodiles hate getting their eyes poked so when the croc has got you in his jaws just reach out and scratch his eyes and he will let go. They also do not have much muscle to open their mouths ( but a lot to close it) so if you wrap your arms around his mouth you can stop him from biting, which is a good idea as, due to the crocs not brushing their teeth too often, bacteria from their mouth tends to infect the wounds that bad that even after the skin has already healed there is still infection underneath and the doctors might have to cut you open again to treat this. Then get out of the water ASAP and start filling out the travel insurance claim form and negotiate a lucrative deal with a TV station, in recent years it has become more common for the media to pay people for exclusive rights to their story so don't give it away too cheap. 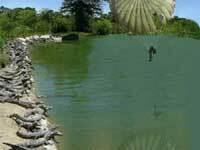 If you are being chased by a crocodile run in a zig-zag pattern, crocs can outrun a horse on a short distance but only in a straight line. It might also help to keep a bag of mussels with you as an Aboriginal woman in 2003 managed to fight off a croc by hitting it with this and lived to tell the tale. One traditional way of 'testing the water' in Australia is to send in the dog first. If he is still there by the time you finish your first beer then it is probably OK. This technique is not recommended and also impractical as many overseas visitors do not have their dogs with them. Maybe if you are staying with friends or relatives in Australia you can borrow their dog. 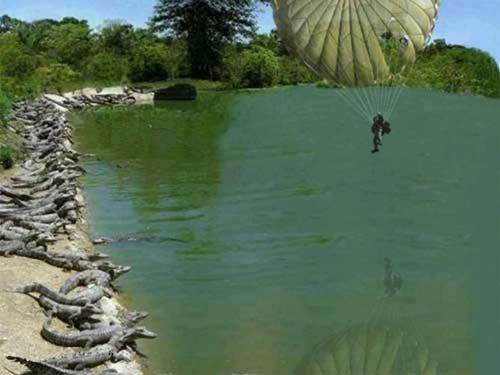 It is advisable to check the map for crocodile farms before you go parachuting. Feel free to call the Queen whatever you like but when surrounded by real Aussies do not tell them the Aussie beer is crap or say anything negative about Don Bradman unless you have a very good travel insurance or have held a black belt in karate for some time. If there is a big sporting event on the screen in the pub where you are make sure you know which team is the favourite of the locals and do not cheer too loud when it gets trashed by the other team. If you're in a bar that employs bouncers do not presume they are there out of concern for your safety, it is not uncommon for bored bouncers to get stuck into (drunk) customers if there are no real trouble makers, avoid any arguments with them. Americans: If you're an American traveling in Australia you will find it a pretty safe country where you are unlikely to get kidnapped, tortured, shot, or blown up and have your corpse dragged through the streets like in some Middle Eastern countries. But should you want to avoid any chance of political discussion you can disguise yourself as a Canadian with a special kit from T-shirtking.com. For U$24.95 you get a complete disguise. A T-shirt with the Canadian flag and the saying "O Canada! (National Anthem), a patch for your luggage or backpack, a window sticker and a lapel pin. Plus - Free Report - How to Speak Canadian, Eh?! French: most Australians have short memories so the nuclear bombs in the ocean to our east and the blowing up of the Greenpeace Rainbow Warrior in our Kiwi neighbour's harbour are now forgotten and you should be pretty safe. If you don't want to stand out as a tourist avoid drinking Foster's beer, stick to VB, or XXXX in Queensland. You might want to find some shade on the beach from that Aussie sun but remember not to find it under a coconut tree; coconuts are heavy and they often fall from great heights. Worldwide an estimated 150 people a year are killed by fallling coconuts, ten times more than by crocodiles and sharks together. 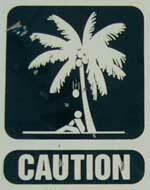 The Douglas Shire Council in North Queensland even cut down some coconut trees worried about legal liability. Above radio alphabet copyright of Amazingaustralia.com.au, but may be republished on your site with acknowledgement, and may be used at any time in phone and radio communications, at own risk.